Now is the perfect time to scrap all of those Easter pics from last weekend and Kim has a beautiful little freebie for you on her blog for that very occasion! Click on the preview to pay her a visit and don't forget to leave a little love! Be sure to stop by Cen's blog and pick up this great little quickpage freebie she has for you! Click on the preview to go to her blog and don't forget to leave a little thank you! Be sure to stop by Kristi's new shop at SDK and check out the wonderful designs she has available for you! Butterflies Are Free To Fly is a warm kit full of rich and inviting papers and elements sure to add a little magic to any layout. It's a Girl Thing is a kit all about being girly. Papers in shades of pink and blue along with elements including blue jeans, bows, and butterflies, this kit is perfect for creating layouts for that girly girl in your life! Weekends With Grandma Cathy is a mixture of bold, rich papers and elements sure to add a little warmth to your layouts. Oopsie Daisies is a fun and carefree kit full of gorgeous papers and elements including flowers, ribbons, and journal paper. A must have for any digital scrappers collection! Come by and check out some of the wonderful products in Lynn's new store at SDK! Spring a Ring Ding leaves you filled with feelings of a fresh spring day. 20 papers and a variety of flowers, leaves, and butterfly elements makes this kit perfect for scrapping all of your springtime memories. Monster Dreamz is a brilliant, bold colored kit sure to add a little fun to any layout! Tons of papers and elements to capture your imagination and the little monster in your life! Fairy Floss combines shades of pink and cream to create a kit with the fluffy textures of cotton candy delights! This huge kit of 20 papers and elements including butterflies, flowers, and more is the perfect kit for feminine or springtime layouts. Soft Whisper combines shades of tan, blue, and peach for a kit with a little breath of spring. Add elements of flowers and ribbons to coordinating plaid and textured papers and add a breath of spring to any layout. Caress was created with romance in mind. Papers in shades of green, pink, and red combined with beautiful roses, hearts, and delicate flowers this kit is sure to add a touch of love to your layouts. Hoppy Day is a fun and happy kit in shades of pink, green, and purple. With 20 papers and cute bunny, egg, and butterfly elements, this kit provides enough stuff to create a variety of cute Easter layouts! Rocker Chic Paper Pack comes with 20 vibrant, grungy papers in black, red, and grey for that wild child in your life. Rocker Chic Element Pack comes with coordinating elements including CDs, skull frames, and more to make your pages rock with style! Start your engines and race over to SDK to pick up this fun new kit from Sammy! Derby Races comes with 4 patterned and textured papers in bright, fun colors and 9 elements perfect for that little (or big) boy in your life! Be sure to stop by Sammy's shop at SDK and pick up this kwik little kit today! Lorie has added a great little sampler pack from her Bundle of Joy 2 collection to her SDK shop! Bundle of Joy 2 Sampler contains two 12 x 12 papers, 1 pink star frame, 1 ricrac ribbon, and two 6 x 4 brag book quickpages. This great little kit is perfect for any baby layout and is suitable for both boys and girls! Want more scapping options? Then pick up the complete Bundle of Joy 2 kit and Add On packs! Sue has added some great new products to her SDK shop! A revival of one of Sue's earlier kits Precious, Precious Little One contains all new papers in shades of pink, white, and blue. From spots to ginghams in lovely, delicate textures, this kit is a must have for all your baby layouts! DigiStarts Commercial Use Paper Templates 1 and 2 each contain six digitally designed paper templates for you to create coordinating backgrounds for all your layouts! Use separately or blend together for a one of a kind look! Stop by SDK and pick up Sue's contribution to this month's Fresh Air Supa Digi Kit Freebie! Fresh Air Quickpages comes with three quickpages that you can use for all your springtime layouts. Just pop in a photo for a quick and easy layout in minutes! Be sure to pick up the entire Fresh Air Supa Digi Kit in our On The House section at SDK! Please help us welcome the following new designers to the SDK family! Welcome ladies, we are thrilled to have you with us! 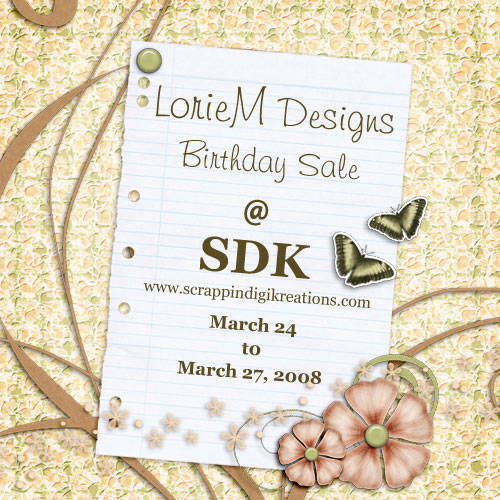 Lorie has added a new collection to her store at SDK! This cute and colorful Bundle of Joy 2 collection is perfect for scrapping those baby and toddler memories in shades suitable for boys and girls! Bundle of Joy 2 Kit contains eight 12 x 12 papers and 41 elements including baby pins, cloud journals, word art paper strips, and more! Bundle of Joy Add On contains six 12 x 12 papers and 27 elements that coordinate perfectly with the kit! Click on the previews to pick up these great kits or click here to see all of the wonderful designs available in Lorie's store at SDK! Add a junky eclectic look to your layouts with this fabulous new kit from Sue! This kit contains four styles of flowers decorated with glitter, chalk, and pencil crayons and are perfect for that finishing touch to your layouts, frames, and more! Pick up this great kit by clicking on the preview or click here to see all of the wonderful products available in Sue's store at SDK! Add a little vintage elegance to your Easter layouts with Herald's new Vintage Things Easter Paper Packs! Each kit contains 6 nostalgic papers which are perfect for scrapping those Easter memories of yesteryear. Pick them up at Herald's SDK shop and be sure to check out her entire Vintage Things collection! Ah spring...the season of romance. 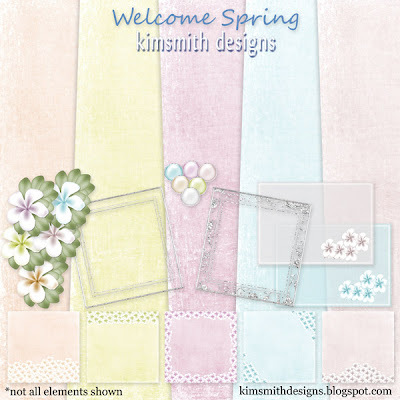 Let your layouts bloom with the delicate colors of spring with Kim's new Spring Romance collection. The Spring Romance Paperpack contains 10 papers in elegant, yet shabby linen papers in pale shades of pink, peach, blushed tan, and blue. The Spring Romance Element Pack comes with 34 coordinating elements including flowers, journal cards, swirl accents, and more. Perfect for adding a soft, femine touch to all your layouts. Pick up this great kit today at Kim's shop at SDK! Spring is upon us and what better way to scrap all of those wonderful spring memories than with Sammy's new Just Spring Kwik Kit! This delightful collection of eight 6 x 8 papers and 13 coordinating elements in spring colors is sure to be used over and over again! Stop by Sammy's shop at SDK and pick up this sunny little kit today! Add some fun to your next layout with this great Graffiti Kit from Cen! 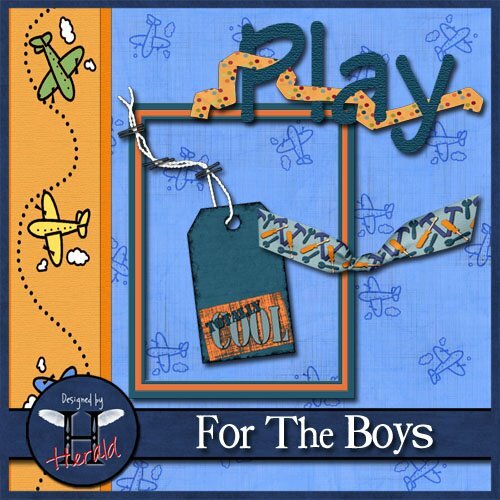 Designed with teen boys in mind, this bold kit with just a touch of rebel will add color and fun to any layout! Stop by SDK and pick up this sweet little Easter Violets Mini from Herald. In sweet colors of violet, lavender, and amethyst, this kit is perfect for all your Easter and spring layouts! Lorie is celebrating a birthday and you get the gift! Stop by her store at SDK between now and March 27th and save an additional 30% off her entire store! Check out these new quickpage and brag book sets from Cen! Tina Prima Ballerina Brag Book Set contains eight 6 x 4 brag book layouts. Just add your photos for a quick and easy brag book perfect for gift giving! The Tina Prima Ballerina Quickpage sets contain two 12 x 12 quickpages each and are the perfect alternative to doing it yourself! Use together or separately for a quick one or two page layout perfect for cute little girl layouts in a snap! While you're at Cen's SDK store, be sure to check out her coordinating Tina Prima Ballerina Paper and Element Packs too! Be sure to stop by SDK and pick up the newest addition to this month's Supa Digi Kit Fresh Air. This kit by Cen contains 4 papers and 8 elements that are bursting with the promise of Spring! Just click on the preview to pick up Cen's portion of this great collaborative kit and be sure to stop by our On The House section at SDK to pick up the rest of the kit! Lil' Things Flurry of Flowers from Sue Wood is the perfect addition to your scrapbooking collection. This pack of felt flowers in all the colors of the rainbow is sure to add the perfect touch to any layout. Layer the pieces and adding stitching, stems, and jewels to create a unique look all your own! Click on the preview and pick up this jem of a kit at Sue's SDK shop today! Need a little help getting started on your next layout? 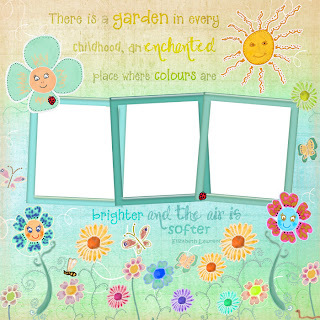 Why not try one of these great Template Sets from Doreen! Template Sets No. 07 and 08 each come with two 12 x 12 layered templates plus real elements and individual PNG files. Use them together or separately to suit your layout needs! Template Set No. 09 comes with two connecting 12 x 12 layered templates and one 12 x 24 complete layered template plus individual PNG files. Head on over to Doreen's shop at SDK and pick up these wonderful templates today! And while you're there, check out all of the other great products available from Doreen! This great 2-page quickpage set from Doreen is a quick and simple solution to any spring romance layout. Use together or separately for a great layout on the go! Create a coordinating flower in your choice of color with this Flower Action from Doreen! This action works with Photoshop CS2/CS3 and is also available for commercial use. Choose personal or commercial below to and create a nice finishing touch to any layout! Kim also has a freebie for you on her blog! 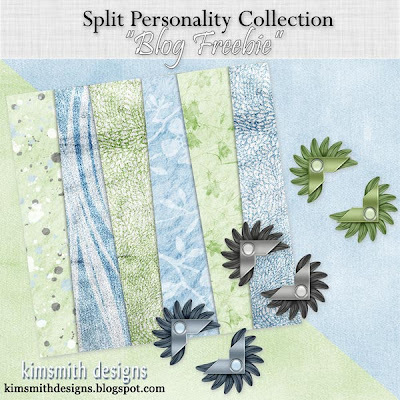 Be sure to pay her a visit and pick up this freebie from her Split Personality collection. Click on the preview to go to her blog. Then, be sure to check out the entire collection at her SDK store! Herald has this great For The Boys freebie available on her blog. Click on the preview to pay her a visit. Then, head on over to her SDK store to pick up the rest of her For The Boys collection! 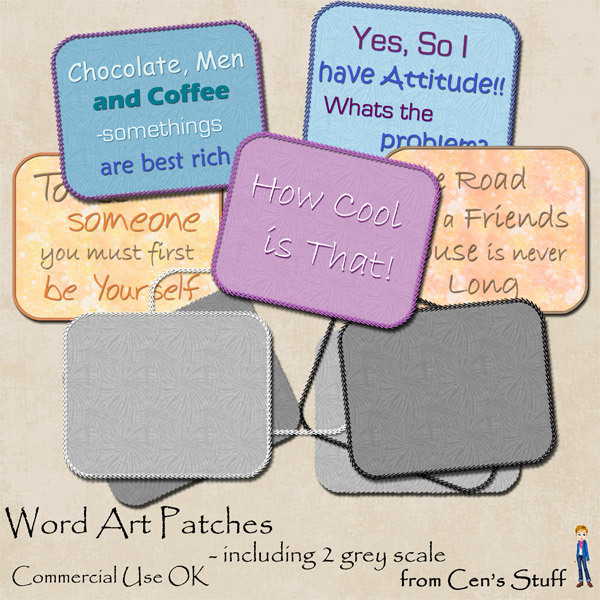 Cen is offering this great little Word Art Patches freebie on her blog. Pay her a visit by clicking on the preview and be sure to leave her a little love! Mix and match elements for kwik and easy pages with Sammy's new Vienna Kwik Kit. This kit of 4 patterned and textured papers, 3 element clusters combining a mixture of ribbon, lace and flowers, and 8 separate elements including flowers, ribbons, and bows make the perfect addition to your scrapbook collection and coordinates with Sammy's Vienna Brag Book Kit. Stop by Sammy's store at SDK and pick up this wonderful collection today!